Chewbacca was the subject of an animated rockumentary composed by the band Supernova. In it, he battles Hitler, saves Betty Rubble and, erm, uses the toilet. Chewbacca was briefly transformed into a human so he could appear in the movie Highlander. Chewbacca is actually made of sponge, marzipan and jam, and is so very very tasty. Much tastier, in fact, than a stormtrooper coated in butter. 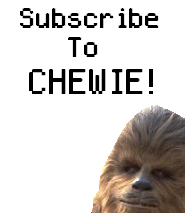 Chewbacca’s head is actually edible and considered a delicacy in certain Asian and Central American countries. Some say that one munch on the hallowed fur can lead to a level of strength humankind cannot quantify. When alone in the Millenium Falcon’s cockpit, Chewie likes to get groovy. Chewbacca is secretly a multimillion dollar rock star.